This will be that last in this series Mocking Sitecore with Microsoft Fakes Links to Part 1 and Part 2 . To end end th series I will revisted a old blog post found here. 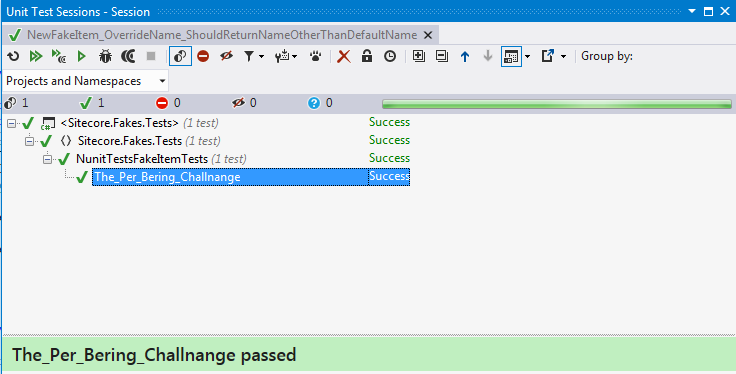 In the original post I I created a TestItem, to test some old Production code. So in this post i will Test the same piece code. First a view of the code we want to test. With code above there a two ways we can test it. We could as in the original post create an Item mock using fakes, or we could overwrite the extension method something that is not possible with ordinary mocking frameworks. Here below I will create an Item Mock. ValueGet = () => "0"
ValueGet = () => "1"
Since the code only use extension methods to access item data it might make more sense to overwrite these methods to isolate any faulty implementations of item access in the extensions methods. This is shown below. In this post I will continue where part 1 left, you can find part 1 here. 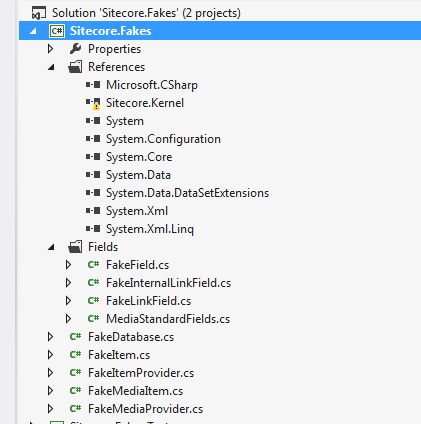 This post will be rich with examples on how to use Microsoft fakes, now included in VS 2012 Premium, to mock out different parts of Sitecore. All the Examples has been chosen, because I think they include some of the most used functions or interactions with Sitecore. They are all really small example, and you can off course combine them as you like. To start with lets take a look at the Sitecore Item and some of the properties not covered in part 1. With that covered lets see some examples of how to mock the Sitecore Database. Finally lets combine the two above and try to mock the Static context of Sitecore. How often have you wrote Sitecore.Context.Item, Sitecore.Context.Site or Sitecore.Context.Database. With that i think we pretty much covered some of the most used properties and method from Sitecore, without creating wrappers. If there are some missed examples of examples you would like to see please say so. Otherwise stay tuned for Part 3.